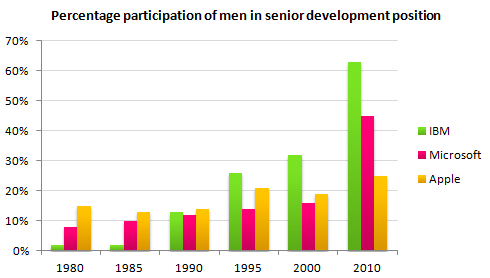 The bar chart shows the percentage of men in senior development position in three companies from 1980 to 2010. While more men were in senior positions at Apple than other two companies in 1980 at 15%, the trend was fairly erratic with a 2% drop to 13% in 1985, followed by a rise of 1% five years later. In 1995, men held 7% more top development jobs than in 1990. After a slight drop back to 19% in 2000, by 2010 25% of top posts were filled by men. By contrast, at IBM men fared much better. In 1980, 2% of senior posts were occupied by men with no change five years on. By 1990, the figure had increased to 13%, doubling to 26 per cent in 1995. Five years afterwards, there was a 6% increase in male senior development jobs with a near twofold jump in 2010 to stand at 63%, the highest for the three companies. The situation was less remarkable at Microsoft than the other two firms except for the year 2010. In 1980, the percentage of senior posts held by men was 8% climbing at the rate of 2% in each subsequent period until 2000, after which it leapt to 45%. From the data, it is clear that men dominated senior posts at IBM by 2010. Test tip: make sure you read all of the information provided very carefully. Look at the statistical information you are given and choose the most important features. Look for data which is the same or similar and features which show important differences or changes.